Public spaces have always gone hand in hand with commerce. Markets, vendors, and retailers are essential components of many a great place. But when does vibrant economic activity cross the line and become crass commercialization- Everywhere we look people who manage parks and squares are struggling with this question. Too often, it seems, commercial interests take advantage of our public spaces at the expense of people who regularly use them. Excessive commercialization has struck public spaces everywhere. In New York, midtown's Bryant Park becomes temporarily off-limits to the general public when the Mercedes Benz New York Fashion Week sets up its tents and puts on its semi-annual display of haute couture. Including the time it takes to set up the event and re-grow the grass after it ends, each "Fashion Week" actually consumes 45 days---a whopping 90 days out of each year. Certainly, commercial activity is appropriate in parks, and major corporations sponsor many events that are open for public use and terrific additions to the park experience. In Bryant Park, neighbor Home Box Office sponsors a Monday night movie series, and ABC's Good Morning America sponsors Friday morning events. A Smithsonian Folklife festival on The National Mall is conducted every year with sponsorship, but it is not used as a product launch for a major cola company. These events succeed because they do not exclude people or promote merchandise with a heavy hand; you come away knowing that the event was staged for the public good rather than private gain. In addition to large-scale events, the trend of over-commercialization is apparent in the design of retail kiosks and storefronts in and around public spaces. When a square is bordered by chain franchises that don't respect the local context, it sends a signal that the space no longer represents the surrounding community. The best public spaces provide their users with a sense of ownership and identity. But if your local park or square is surrounded by generic franchise architecture and aggressive commercial signage, the place becomes less distinctive and its users feel no personal connection to it. PPS has long recognized the revitalizing effect of economic activity, but how can you separate healthy commerce from harmful intrusion? The key is to identify activity that will strengthen the image and identity of a place. When PPS develops recommendations to improve a place, one of the first questions we ask is which local businesses and institutions can contribute to the place in question. When you bring these partners into the process, you end up with vendors, retailers, and events that better represent the surrounding community. 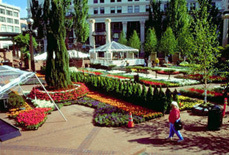 Pioneer Courthouse Square in Portland, Oregon is a stellar example of a community-based approach to commercial events. This square also features a "Fashion Week" in the middle of September, but unlike Bryant Park's, it is free and open to the public. Previews of local designers' spring collections are displayed in the square for a week. The audience is not just a passive receptacle during the event: They are invited to vote for their favorite designs as part of the "People's Choice Award." Appropriately, the "Fashion Finale," a paid event that is the principle fundraiser of Fashion Week, does not take place in Pioneer Courthouse Square, but in the Portland Museum of Art. Thus Portland's Fashion Week raises money and gives valuable publicity for local entrepreneurs without excluding people from the city's most beloved place. Pioneer Courthouse Square uses events to showcase its city's resources for the world to see, like all great public spaces should. Fashion Week is just one among hundreds of such events, including the annual Festival of Flowers (right). 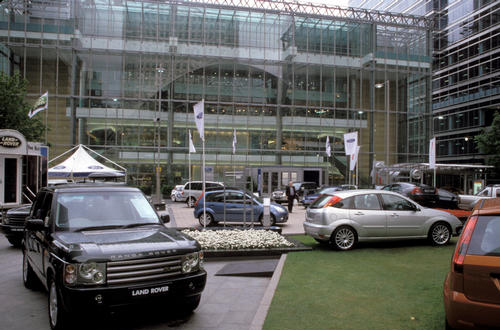 The promotion of local assets is one component of the criteria PPS has drawn up to judge when commercial activity is beneficial to a public space, and when it is a detriment. We hope these guidelines will prove useful in planning events, selecting vendors, and working with private sponsors that support public spaces. Commercial activity must not diminish the essentially public nature of the place where it is staged. Events in public spaces should remain accessible to all users, without a fee or invite list. This is especially true of smaller spaces like Bryant Park, where a major event can render the rest of the park unusable. The exceptions to this rule are large urban parks that often show concerts and performances for a nominal fee: These spaces are ample enough to accommodate paid events without alienating users who don't attend. Accessibility also means keeping spaces visually open. Closed tents and opaque fences shut people out and say, "You're not wanted here -- keep out." The more visually open the space, the more inviting it will feel. A good public space should project a strong image that reflects the surrounding community. Bringing commercial activity into the space can be a sure way to strengthen its image -- or weaken it. Local food vendors, farmers markets, and events that promote area entrepreneurs reinforce the connection between a place and the surrounding community. This connection is diminished, though, by the presence of generic franchise designs or events where sponsors' logos dominate. When the corporate image is too strong, it comes at the expense of the place's image: The place will lack a strong identity and users will not feel they have a common stake in it. The best commercial activity in public spaces is not a one-way street -- users should feel like they're part of the action. When people are given a chance to participate, even in a small way like conversing with local growers at a farmers market, it lets them know they are more than vessels of consumption. Sometimes a clever but simple touch can make all the difference, as with the "People's Choice" voting at Portland's Fashion Week. Participatory commercial activity can be elusive, but when done successfully it is extremely rewarding. People know a place is their own when they are an active part of what happens there.